Buy this creative industries marketing book online now. Buy the book as a paperback, eBook or Audiobook. Signed paperback books are available on request. Books are signed by David Parrish, with a personalised dedication. Books are delivered world-wide in a clear presentation box. Buy the book as a gift for your favourite creative entrepreneur! See full details and prices for signed paperback books. 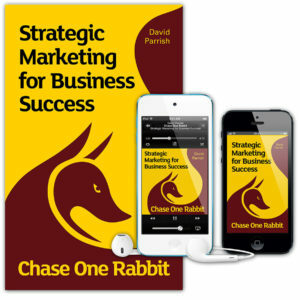 Chase One Rabbit combines inspirational stories and practical techniques, inspiring entrepreneurs to make their businesses even more successful by using strategic marketing. International consultant and trainer David Parrish illustrates key strategic marketing messages by drawing on stories from his own experience as an entrepreneur and from the successes of his clients worldwide. Each of the 63 short sections provides food for thought, suggesting practical things you can do immediately to improve your business. Practical and progressive, it’s designed for businesses large and small – from start-ups to mature businesses – with a wealth of ideas and inspiration to dip into every day. Buy the book online now, in eBook, paperback or audiobook format. Published in Spanish and French translations in paperback and eBook formats in 2015. Published as an AudioBook in 2016. Chase One Rabbit is about focused marketing. It’s about understanding your business, to create strategies that help you sell it to best effect. It combines inspirational stories and practical techniques, giving creative entrepreneurs the tools to make their businesses even more successful by using strategic marketing. ‘How to sell?’ is an age-old question. International consultant and trainer David Parrish illustrates key strategic sales and marketing messages by drawing on stories from his own experience as an entrepreneur and develops marketing case studies from the successes of his clients worldwide. Chase One Rabbit has been developed specifically for the eBook market. Each section is succinct, with a clear focus on helping you create a strategic marketing plan. Each topic includes ‘what to do next’, and related marketing subjects, to help you clarify and refine your marketing objectives and get the best from your creative business. You’ll discover the strengths of buzz marketing and reap the rewards of word-of-mouth recommendations. You’ll understand the difference between operational and strategic marketing; between marketing communications and a synchronised, streamlined strategy. Sales and marketing should flow seamlessly together, underpinned by a marketing strategy that is unique to your business, sector and audience. David poses questions and analyses examples, creating a marketing toolkit to develop your own authentic marketing strategy with precision techniques and a polished sales pitch. Chase One Rabbit gets you to think about strategy and sales, profit and precision marketing; being your ‘authentic’ self so that selling doesn’t feel like a chore, and understanding what you’re selling, and why your customers want it. It helps you to define the value of selling a creative product or service and gives you both ideas, and constructive ways to achieve them. And it will make you think about local, national and international markets. In an age of digital and internet marketing, it’s about making sure you pick the right tools for the job. It also deals with the unique complexities of running a business in the creative industries; of working in a sector you’re passionate about, valuing your work, choosing the right customers, marketing effectively and making that business profitable and successful. 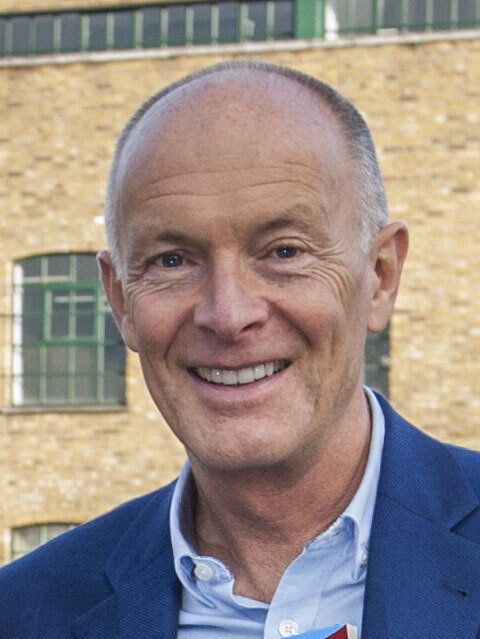 David Parrish has worked around the world with creative entrepreneurs, small businesses, digital SMEs, arts organisations and business development and support agencies. He has worked with hundreds of businesses in more than 40 countries. He specialises in creative and digital industries, helping entrepreneurs use the creativity they employ within the business on their business, devising and implementing new business models and clever marketing strategies. Chase One Rabbit is his second book, following one of the most highly-acclaimed creative business books ‘T-Shirts and Suits: A Guide to the Business of Creativity’, which has been published in translations in eight countries. Chase One Rabbit is written with creative and digital businesses in mind. As a creative enterprises toolkit, it is relevant to all businesses and organisations in the creative industries including cultural enterprises and arts organisations. According to Ray Hanks, Chase One Rabbit is the best marketing book he’s ever read (watch video).